Place the Torso on the OR bed. Tape the Torso to the OR bed to prevent movement during the procedure. Drape the simulator in the normal fashion. Make a midline incision in the center of the Laparotomy Sim Disc. Disect through the adipose tissue using the knife, bovie, or scissors until the superficial vessels are encountered. Clamp, cut and tie the vessels as needed. Continue to dissect through the adipose tissue to the fascia layer. Incise the fascia with the knife and mayo scissors. Apply Ochsner clamps to the edge of the fascia layer. Bluntly dissect the fascia layer away from the muscle, using a knife, metzenbaum, or mayo scissors. 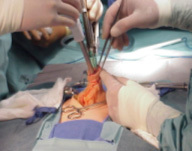 Grasp the peritoneum with two hemostats and incise the tisue with the knife or metzenbaum scissors. Once the abdominal cavity is opened, place a Balfour retractor or other appropriate self retaining retractor. Grasp the omentum (optional) and reflect it superiorly to expose the bowel. A lap sponge may be placed in the abdominal cavity. Place clamps above and below the portion of bowel to be removed. (Remember, do not take a large portion of bowel. Leave enough to perform at least two more procedures) The involved area is removed with a scalpel. The continuity of the gastrointestinal track is established by an end to end, end to side, or side to side anastomosis. Potentially contaminated instruments used on the bowel are placed in a discard basin and removed from the field. Including sponge forceps and suction. Remove the lap sponge and draw the omentum over the cavity. Close the peritoneum, fascia, and adipose layers with appropriate suture. Close the skin with suture or staples.